“THE JUDY GARLAND SHOW” Rights Up At Auction for $1.5M Today, The Royalty Exchange launches the auction for FULL OWNERSHIP to the US RIGHTS of THE JUDY GARLAND SHOW at $1.5M. This astounding offering contains ALL 26 CLASSIC EPISODES of the 1963-964 CBS variety show. For the first time, the general public will be able to own the rights to a piece of Judy Garland’s historic entertainment career. In addition to the complete episodes, the masters in the auction also include OVER 15 NEVER-BROADCASTED SHOW OUTTAKES, a behind-the-scenes photo gallery, press and glamour shots from the show, and an audio commentary with those involved in the original broadcast of the series. Tulsa Symphony to perform with remastered ‘Wizard of Oz’ The production, created by John Goberman, producer of the award-winning PBS series “Live from Lincoln Center,” combines the showing of a newly remastered print of the 1939 classic film starring Judy Garland, Ray Bolger, Bert Lahr and Jack Haley, with an orchestra performing the complete score – all the Arlen-Harburg songs as well as Herbert Stothart’s Academy Award-winning score that weaves together original music, motifs from the songs, even bits of Mendelssohn and Mussorgsky. “Tulsans will be treated to a presentation of this film such as they have never seen or heard before,” said TSO executive director Ron Predl. 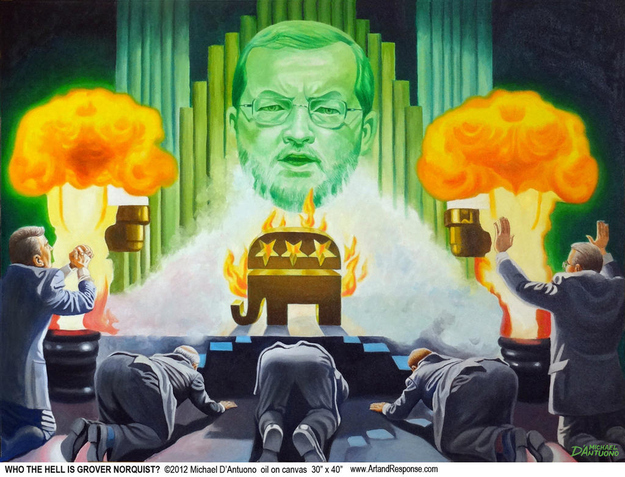 Grover Norquist Portrayed As The Wizard Of Oz Artist Michael D’Antuono has painted anti-taxi activist Grover Norquist as a Wizard of Oz-like disembodied head with Republican politicians bowing before him as an elephant burns, to symbolize Norquist’s powerful position in the Republican party. D’Antuono previously stirred some light controversy in 2009 with a painting of President Obama wearing a crown of thorns. Warner Bros Wants Zemeckis For ‘Wizard Of Oz’ Remake Based On Original MGM Script Warner Bros is in early talks with Robert Zemeckis to direct a live-action remake of the The Wizard of Oz and plans to use the original script from the 1939 classic. Warner Bros owns the screenplay because Ted Turner bought it along with the MGM library before Warner Bros bought Turner’s empire. To all the readers of the Daily Ozmapolitan, have a wonderful Thanksgiving! Disney’s Epcot International Flower & Garden Festival to have Oz theme “Guests can follow in the footsteps of Oz The Great and Powerful by playing carnival games in a circus-themed area. Here red-and-white tents will offer all kinds of midway games, plus fun photo opportunities,” said the Disney Parks Blog. The Land of Oz play area will include play equipment adorned with flowers and settings and props similar to what’s seen in the movie. The 2013 festival at Epcot returns March 6 and is included as part of an Epcot admission. Wizard of Oz Adult Pantomime Darren King’s re-scripting of ‘The Wizard of Oz’ which is produced by Sue Clarence, starts with the beautiful ‘Somewhere Over the Rainbow’ exquisitely sung by Dorothy, played by Donnagh Roberts who is busting very provocatively out of her red glitter brassiere. Within a very short time the cast of familial characters has assembled. 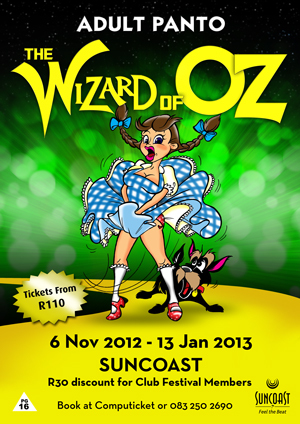 We meet Thomie Holtzhausen as the brainless Scarecrow and car-guard, Marc Kay as the poured-into-his-costume Tin Man and Wentie’s fisherman and Jacobus Van Heerden as the delicately prancing scaredy-cat cheerleading Lion. Of course they all want to join Dotty, the teenage virgin from Umkomaas, as she flees South Africa to seek out the Wizard of Oz for a visa to enter Australia. 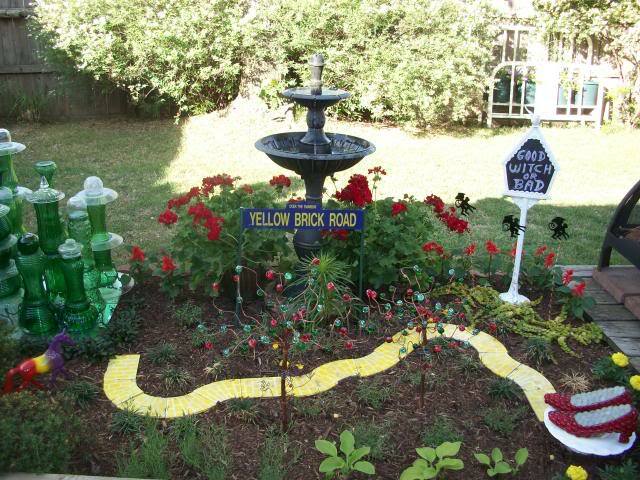 Oz or Wonderland? Disney Really Wants Us to Equate Sam Raimi’s Latest With Tim Burton’s Fantasy Hit What’s your take here? Cynical marketing, or just the way things are when talking about a big-budget prequel from a studio that wants to ensure it ends up with a hit? And until we see even more of the film, can we assume that the similarity between films is more than skin deep? I’m hoping Raimi’s movie has its own personality — it is Raimi, after all — but this isn’t doing much for my sense of anticipation. 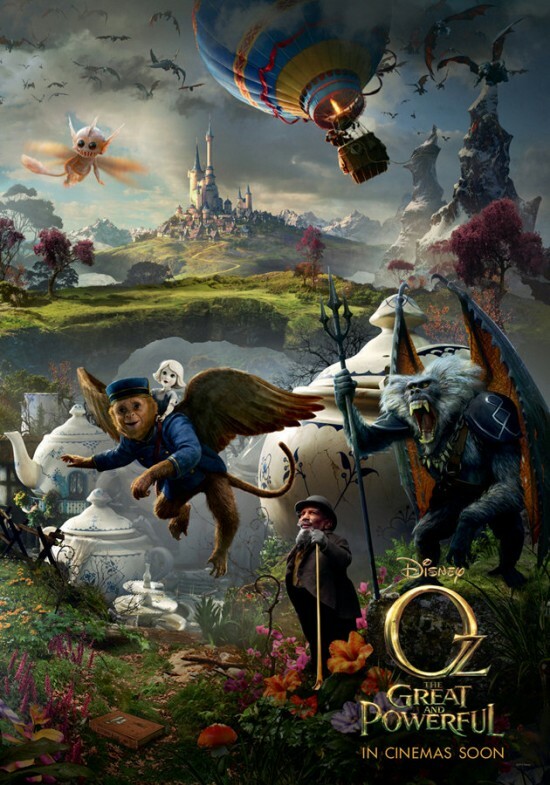 Final ‘Oz: The Great and Powerful’ Poster and Triptych Banner Place Main Characters Front and Center One question the triptych raises, however, is who the witch on the far left is. Does the fact that Evanora (Weisz) and Theodora (Kunis) both appear in the middle mean the green-faced woman is neither of them? Or has Disney simply decided to put one of the characters on there twice? The poses of the witch and Weisz’s center panel rendering are very similar. Jamie McKnight joins cast of The Wizard of Oz Jamie McKnight, who left the group formerly known as The Canadian Tenors in 2009, will play the Scarecrow in the homegrown version of Andrew Lloyd Webber’s new stage adaptation. Other members of the all-Canadian cast announced Tuesday include Gemini Award-winning stage and screen star Cedric Smith as the Wizard. Lisa Horner, who has starred at both the Shaw and Stratford theatre festivals, will play the Wicked Witch. The leading cast is rounded out by actor and choreographer Mike Jackson as the Tin Man, Dora Award winner Lee MacDougall in the role of the Lion, and Shaw festival veteran Robin Evan Willis as Glinda. The ensemble includes Larry Mannell as Uncle Henry and Charlotte Moore as Aunt Em. ‘Oz’-loving PRP youth sets sights on Hollywood through social media Sometime down the road, somewhere over the rainbow, movie fans are going to know the name Angelo Thomas. That isn’t the prediction of some social-media promotional team. Those are the words of movie director Leigh Scott of the Imaginarium film-production company, which makes teen-theme movies based around the story of “The Wizard of Oz.” Scott considers Angelo an invaluable resource, having given him work as social-media manager and website designer and content provider for Scott’s film “Dorothy and the Witches of Oz.” It starred Christopher Lloyd (“Back to the Future” and TV’s “Taxi”) and Sean Astin ( “Lord of the Rings” and “Rudy”). 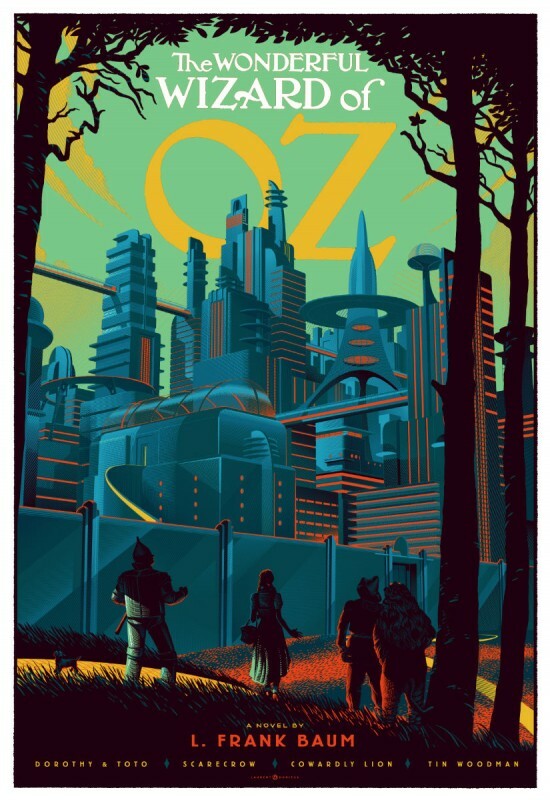 Laurent Durieux’s Gorgeous ‘Oz’ Poster Among The Highlights at ‘Gang’s All Here’ Exhibit in Brooklyn If this summer’s blockbuster film The Avengers taught us anything, is that there’s power in numbers. Thor or Iron Man are good on their own but, when they’re part of a team, they’re great. That team-up mentality is the focus of the latest art show at the Bottleneck Gallery in Brooklyn, NY. It’s called The Gang’s All Here and features art based on films, TV and more where a group of people team up for a cause. Which is actually quite a common story device, once you start thinking about it. The show opens this Friday, November 16 and features some of the best gallery art we’ve seen in a while. For real. Just one example is a piece we’re happy to debut, Laurent Durieux‘s The Wonderful Wizard of Oz, a stunning tribute to L. Frank Baum‘s work. New ‘Oz The Great And Powerful’ Images Show Massive Landscapes, Beautiful Witches, and More Your trip to Sam Raimi‘s Oz is just a few short months away. Oz The Great and Powerful, Raimi’s prequel to The Wizard of Oz, has long felt miles away. But after a crazy summer at the movies and a promising fall, the film’s March 2013 release has crept up on us. That means a whole new onslaught of marketing, which recently started with some new posters. Now eight new images have been released that show the epic scope of Raimi’s interpretation of Oz, and several of the film’s stars (James Franco, Michelle Williams, Mila Kunis, Rachel Weisz) in all their wonderful glory. New ‘Oz: The Great and Powerful’ Poster Takes the Kitchen-Sink Approach, With Hideous Results One of the most intirguing aspects of Sam Raimi‘s Oz: The Great and Powerful has been its eye-popping aesthetic. 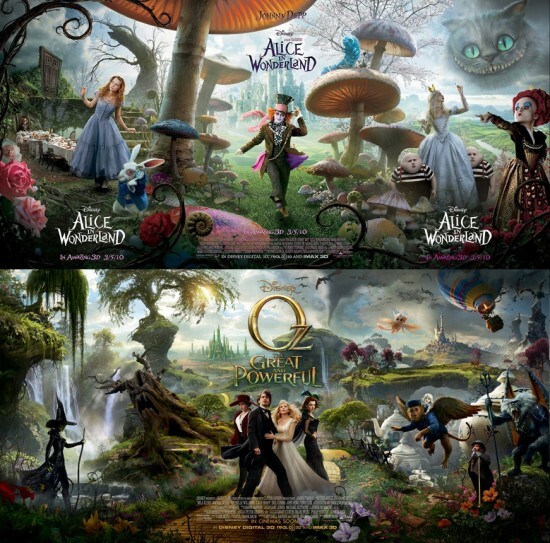 Earlier posters and the trailer were filled with dazzling color and lush landscapes — which, okay, were more than a little reminiscent of Tim Burton’s Alice in Wonderland, thanks to the involvement of production designer Robert Stromberg. But the visuals weren’t really the big problem with that movie. The latest poster retains the same fairy tale feel, but then cranks it up way, way too high. There’s a little bit of everything here, from flying monkeys to teapot houses and a fat, happy munchkin, but the slapdash way they’re thrown together makes the poster makes it look less like a professional piece of work than a slapdash collage assembled by a hyperactive kid emulating Lisa Frank. “Wizard of Oz” dress fetches $480,000 at auction Julien’s Auctions said the price for the pinafore dress and white puffy-sleeved blouse that Garland wore throughout the 1939 film classic was in line with estimates. But it was well below the sky-high figures paid last year for Hollywood costumes worn by Marilyn Monroe and Audrey Hepburn, and a similar dress worn during tests for “The Wizard of Oz” that fetched $910,000 in 2011. Auctioneer Darren Julien said the price difference was due to the fact that only a few test dresses were made for “The Wizard of Oz,” while there are about seven versions of Garland’s signature gingham pinafore. 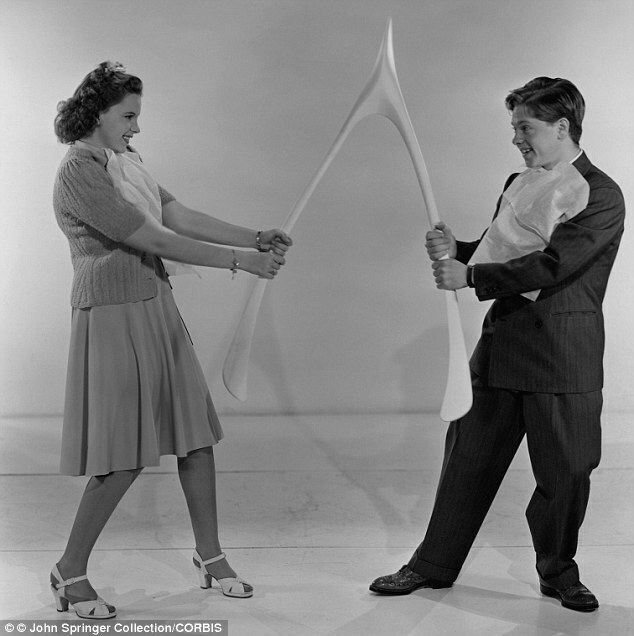 The buyer of the Judy Garland dress, made by MGM costume designer Adrian, was not identified. Jonathon Brandmeier speaks to the last munchkin of Oz A munchkin from Oz has landed in Chicago! Jonathon Brandmeier welcomes to the studio 89 year old Margaret Pelligrini, one of the last remaining munchkins from the classic film “The Wizard of Oz”. Margaret clears up 73 years worth of rumors and tells Johnny what it was like to be part of one of the most iconic films of all time. Find out how you can meet Margaret this weekend!